Suitable from 6 months to 3 years of age as an alternative to the evening follow on milk feed. The special blend of organic follow on milk with organic gluten free cereals (rice and buckwheat) makes this drink satisfyingly creamy and well digested by babies. 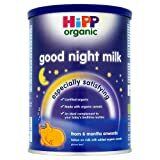 This entry was posted in Organic Health Products and tagged 350g, Good, HiPP, Milk, Night, Organic by Organic Health. Bookmark the permalink.